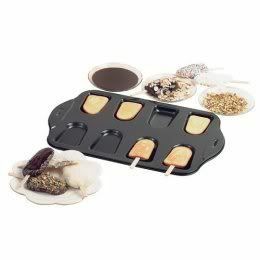 Quirky Jessi: Cakesicles....what were they thinking? Who the heck thinks of this sort of thing? But hey, that sort of stuff is what this place is all about, right? Maybe I should rename this place "quirky kitchen items" or "quirky products people come up with when they're really, really weird." Well maybe that's a little bit too long, but it seems like I just keep coming across things like this! I do think it's a cute idea and a great alternative to traditional cakes or popsicles. I can see this being a hit at a birthday party....or a fun treat to decorate at a slumber party, etc. I have to say that I LOVE cake. But this just seems like a lot of work! I'll take a good old fashioned cupcake!